It was a healthy New Year gift of recognition to the woman barrister of today. This is the first instance a woman has been appointed to sit on the supreme bench; it is the first time a higher court is to be composed entirely of women and it is the initial case where a majority of the judges will be women. The case was the appeal of a land dispute, brought by the Woodmen of the World, an influential fraternal order to which nearly all male lawyers and officials in Texas belonged. By dint of a WOW insurance program, nearly all of them had a financial interest in the case, and so were disqualified from participation in the appeal -- opening the way for the all-woman bench. 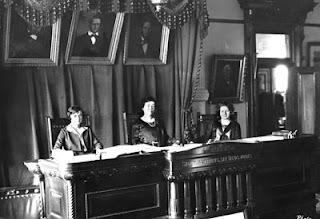 The 3 women Justices who sat on the case are depicted above; from left, Hattie Leah Henenberg, a legal aid lawyer who later would serve as a state and federal prosecutor; Hortense Sparks Ward, a women's suffragist and property rights activist who in 1915 had become the 1st woman ever admitted to the Texas bar; and Ruth Virginia Brazzil, a sometime real estate broker and businesswoman said to have opposed women's suffrage. (photo credit) After issuing its decision in the sole case within its jurisdiction, the special high court disbanded at the end of May 1925.